Living on the Canadian border is one of the perks of living in Whatcom County. British Columbia offers spectacular mountain resorts, cosmopolitan attractions in Vancouver, and beachfront leisure in White Rock. But before you travel across the border, there are a few things you need to know. There are four major border crossings in Whatcom County, referred to collectively as the Cascade Gateway. These include Peace Arch and Pacific Highway, both located in Blaine, and one in Lynden and Sumas, located further east. 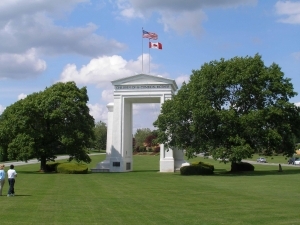 Of all of these crossings, Peace Arch is the largest, and ranks as the third-busiest United States-Canadian border crossing for passenger vehicles in the nation. Wait times at crossings in the Cascade Gateway ports vary, but tend to peak on weekends and during the summer months. While wait times can reach over an hour during these times at the busier crossings, the use of Enhanced Drivers Licenses (EDLs) and NEXUS cards can reduce waits times significantly. NEXUS is a joint bi-national program used for travel between the U.S. and Canada via air, land or sea. Our region leads the way in the use of NEXUS cards, with more than one- third of all cards issued to residents of British Columbia and roughly 6 percent to Washingtonians. All of the Cascade Gateway border crossings have a dedicated NEXUS lane, which means that NEXUS users can expect reduced wait times (note that in order for a vehicle to use the NEXUS lane, ALL passengers must have a valid NEXUS card). In January 2015, a new NEXUS enrollment center opened in Birch Bay Square (See cbp.gov for application instructions). Washington State issues an enhanced driver’s license (EDL) that may be used as the sole document for land travel between the U.S. and Canada. A dedicated “Ready Lane” operates with limited hours at Peace Arch for drivers with EDLs. If you are crossing without a NEXUS or EDL, be prepared to present a passport or other acceptable document that denotes identity and citizenship when entering the United States. U.S. citizens under age 16 may present proof of citizenship using a birth certificate or Naturalization Certificate. For more information about NEXUS and other Trusted Traveler Programs, go to http://www.cbp.gov/travel/trusted-traveler-programs. If you’re new to crossing the border, you need to be aware of items that cannot be transported. For information on prohibited and restricted items, go to http://www.cbp.gov/travel/international-visitors/kbyg/prohibited-restricted.